Gucci gained attention when the leader of luxury apparel and accessories unveiled three remastered variants of its G-Chrono watches at Baselworld this year. Gucci redesigned the G-Chrono watch with a distinctively large 44mm case accentuated by Gucci’s signature “G” around the bezel. 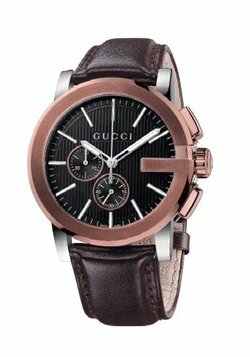 Gucci offers the G-Chrono watch in three variant models of stainless steel, black or brown PVD with each model contrasted by a second accent color. The G-Chrono watch dials feature silver or black vertical ridges with two sub-dials located at 6 and 9 o’clock and hour indication marks along the dial. Each model also has pushbuttons which activate the 60-second and 30-minute sub-dial features of the watch. The stainless steel case and bracelet version features a silver dial with the sub-dials, hands and indexes accented in pink gold. The brown PVD model is adorned with a brown calfskin strap and black dial which is complimented by brown tones on the crown push buttons and further contrasted by a silver stainless steel case and “G” bezel. The black and pale yellow PVD model is adorned with a black calfskin leather strap. 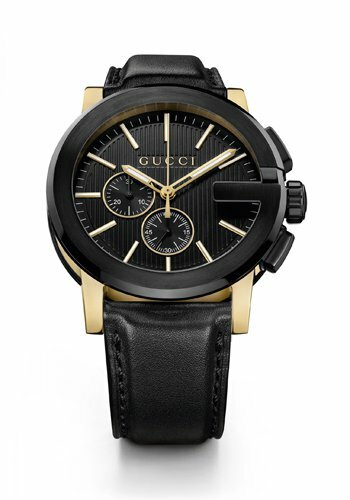 The new Gucci G-Chrono watch design offers luxurious and sporty styling that is refined and capable of transitioning from day to evening attire with fashionable ease. 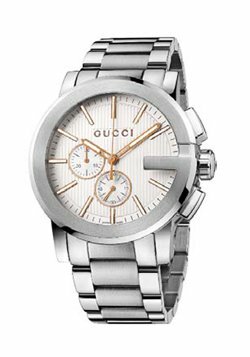 To view a selection of Gucci watches visit Watchesonnet.com. Some watches are built to last for ages, but their outdated looks can make you itch for a replacement long before their mechanics have given out. 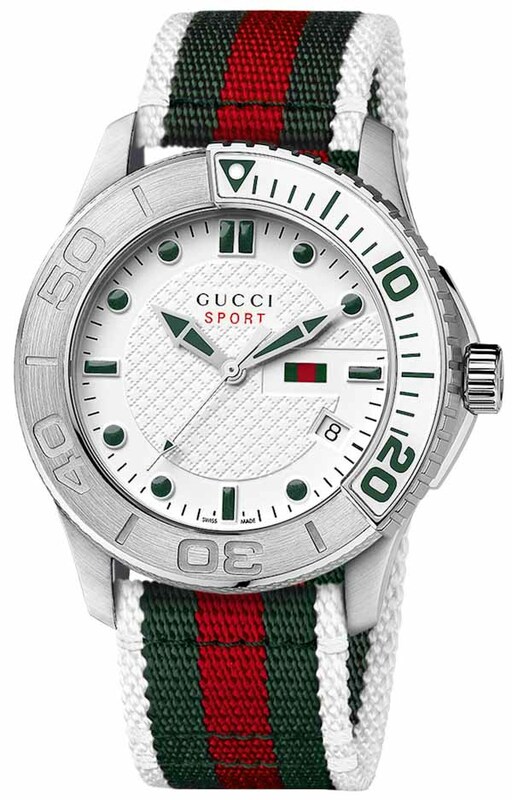 Luckily the Gucci G-Timeless Sport Watch has a great look that will last as long as the timepiece can keep ticking! Part of what makes the watch so “timeless” is its open, bold design. The 44m stainless steel case uses a few splashes of color on the white watch dial to make the watch not only easy to read, but easy on the eyes as well. A few splotches of red add extra variety to the piece, but the rich red and dark greens are far from Christmasy. A red date indicator adds another touch to the piece. The thick rotating bezel also adds a few touches of color and acts as a nice framework for the timepiece. The large numbers on the bezel help draw the eye to the piece without getting in the way of reading the time. The watch hands mirror the same steel-and-green combination seen in the bezel, adding color and clarity at the same time. Though there is a version of the Timeless Sport Watch that uses a stainless steel bracelet, the watch really pops with the more colorful version. The comfortable nylon wristband picks up on the same white, red, and green color scheme in the watch. The band really ties the piece together, adding enough color to make it interesting, and using a material not often found in luxury watches. Nylon may not be a common strap, but its comfortable durability works well with this piece, and can survive dunks in the water as well as the mechanics of the watch—which is water resistant up to 160 ft/50 meters. Of course, the red and green isn’t the only color scheme of the watches. You can check it out with a black dial, red and blue accents, a stainless steel bracelet—you’re sure to find your color match with the Timeless collection. There’s something effortless about the blend of color and texture in all of the versions that really make this simple watch stand out. 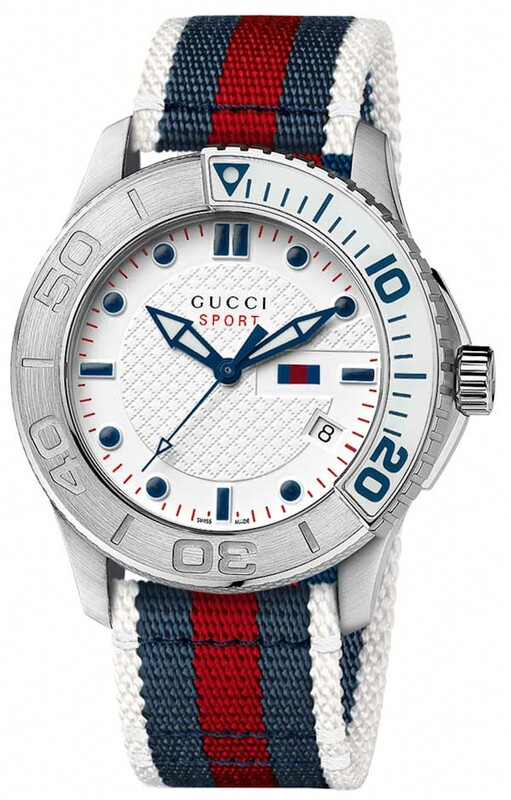 The simple color scheme combined with the large numerals and easy-to-read interface ensure that the Gucci G-Timeless Sport Watch will certainly outlast the fads of the day. The quartz movement is simple, but dependable and a solid foundation for the timepiece. 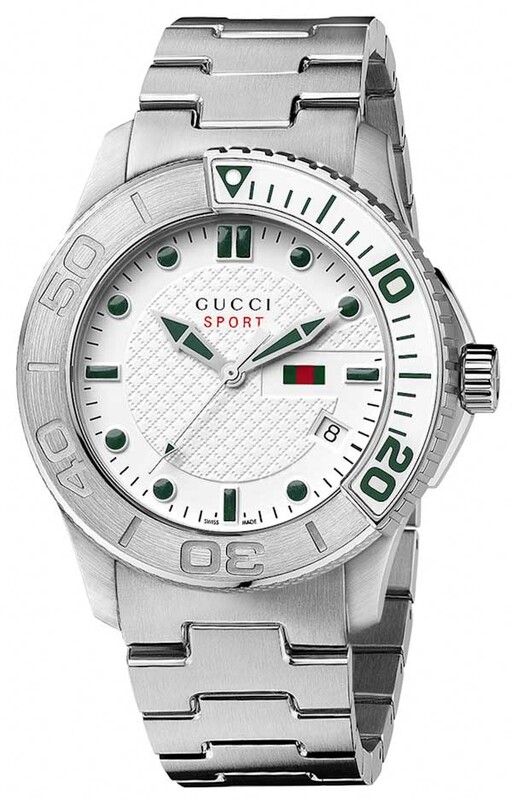 For a watch both timely and timeless, look to Gucci Sport. 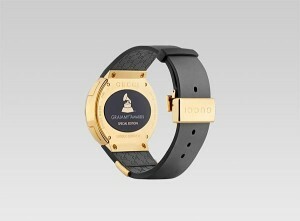 Luxury watch producer Gucci has teamed up with the Grammys to produce a commemorative watch for the music award show. In an exclusive three-year contract between Gucci Timepieces and Jewelry and The Recording Academy (the host of the Grammys), the special edition watch, the I-Gucci, celebrates the fusion of music and creative fashion. 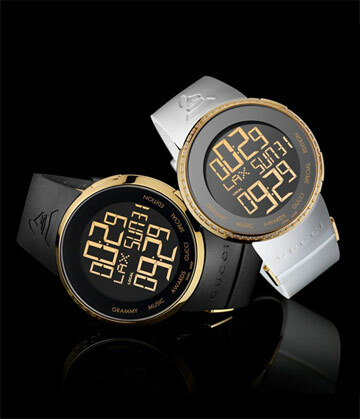 Designed by Gucci’s Creative Director Frida Giannini, the timepiece is Gucci’s very first digital watch. 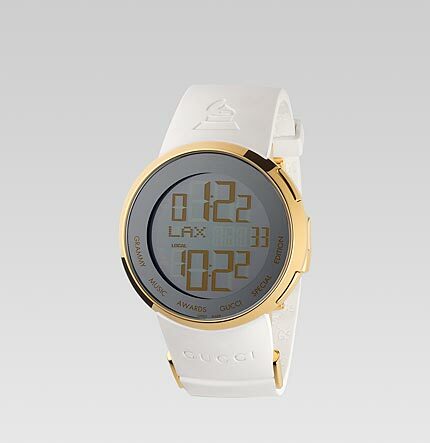 The I-Gucci was created for sleek functionality, with a large watch face, a dual time zone dial (for the recording artist on the go), and two digital hands reading local time. 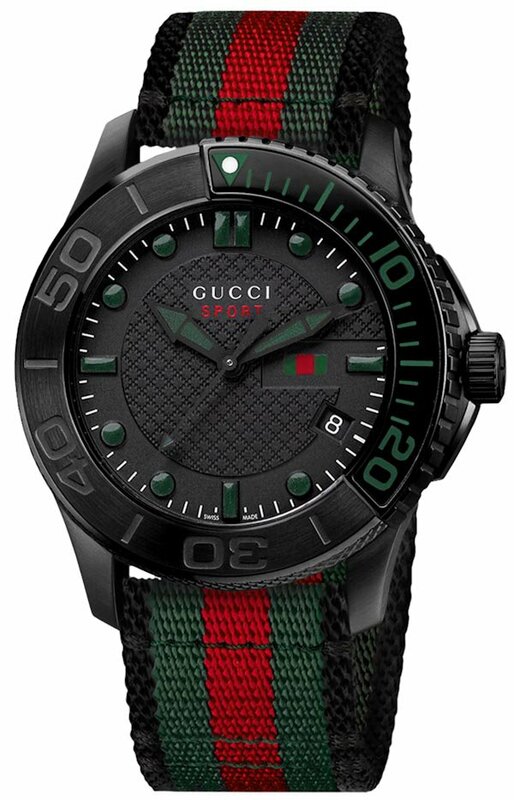 The double-layout of the watch’s digital display face is complementing by special tags featuring both the Gucci and the Grammy’s logo. To further emphasize the partnership, the Grammy logo also includes their special edition label. The collection comes with both black and white watches, but for those truly in the know, there are also a few rare watches with diamonds outlining the diameter of the watch face. The technical aspect of the watch contains a yellow-gold PVD deployment on the buckle and case, which is 44 millimeters in diameter. The black rubber strap is imprinted with the Grammy’s logo, while the matching black dial shows bright yellow digits (or hands if you want to change it). 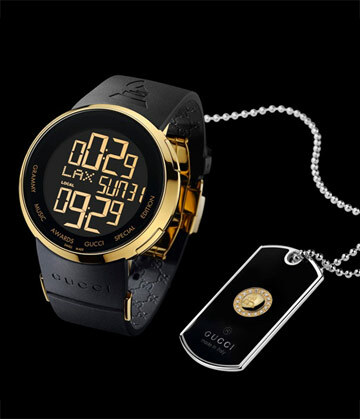 The I-Gucci collection features a Swiss digital dual movement and is water-resistant to 100 feet/ 30 meters. The Swiss made pieces also come with anti-reflective coating on the sapphire crystal watch-face, and have a two-year warranty. When one hears the words “replica luxury watch” the first thing the generally pops into mind is a comical image of a shady guy in a trench coat trying to sell a replica Rolex on the street. But it is not necessarily a laughing matter; these illegal copies of authentic watches cause an estimated one billion dollars of losses each year to the watch industry. The Swiss Customs Service estimates that up to 40 million counterfeit watches are put into circulation every year. So with each purchase of a counterfeit watch, consumers are not only hurting the legitimate watch industry, but also slowing the global economy, as well as participating in criminal activities. 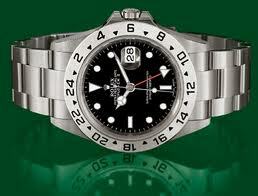 The most common fakes are made to resemble watches made by Rolex and Brietling, big names in the luxury watch industry. But there is also a huge replica watch market for the popular brands Chanel and Gucci. About half of these counterfeits are made in China and sold to tourists. However, a fair amount are made in America and moved across the country to be sold out of car trunks along with fake purses and wallets. Many websites online actually boast the authentic look of their fake watches, and insist their product is better and more reliable than other replicas. There are two main types of counterfeits on the market, one is by trademark violation and the other is by design violation. A trademark violation watch will copy the brand name or symbols of a legitimate watch. It also includes any false claims like “Water/Shock Resistant” or claiming to be made of gold, silver, or any other precious metals. Oftentimes, replica watches will have a few legitimate parts, such a leather straps or gold buckles to fool potential customers. A design violation is when a counterfeit is designed to look like an original, such as using the same model as a Rolex or Audemars. Both of these types of counterfeits are illegal and production can result in jail time. As Valentine’s Day approaches, and many feel their purses tightening, the temptation to wow your significant other with what they think is a genuine Chanel or Bvlgari watch is probably quite hard to resist. The risk factor, however, is not truly worth the gain. Especially if your girlfriend finds out that Gucci watch she has been showing off is a fake! Best to stick with a modest but classy watch for Valentine’s this year. Gucci, famed Italian timepiece manufacturer and luxury fashion mogul, is preparing to lock legal trademark infringement horns with Guess? Inc. Guess hopes for a dismissal of the lawsuit was overturned Tuesday, Feb. 14, when Manhattan Federal Judge Shira Scheindlin agreed that Gucci’s allegations did indeed have merit. Judge Scheindlin rejected motions to dismiss the trademark infringement case based on evidence Gucci provided which validated shoppers confusion between Gucci’s Quattro G trademark versus that of Guess’ knockoff design. It appears Guess choice to develop their design similar to that of Gucci’s was in effect an act of bad faith which reasonably contributed to consumers’ confusion between the two brands. In Guess favor the judge did dismiss Gucci’s two dilution allegation claims regarding its Quattro G and Square G designs as they did provide enough proof to substantiate its claims. Guess attorney Robert Welsh delayed commenting on the judge’s opinion. Guess countered back that it did not blemish or stain Gucci’s influential status, nor did it purposely mislead or confuse consumers with its brand sales. Gucci’s attorney Louis Ederer chose not comment. Gucci, now owned by Paris-based PPR SA, is certainly no stranger to suing copycat companies, and based on the judge’s opinion, Gucci believes it should be compensated to receive an amount of $26 million in damages from Guess and other defendants (co-defendant Marc Fisher Footwear LLC alleged to have used Gucci’s GRG stripe design on its shoes), the sum which its expert believes represents a comparable amount for its damages. Their expert estimates more than $98 million in total profits were incurred as a result of Guess alleged trademark infringement actions. Guess, despite its looming legal battles ahead, closed at $34.10 with its shares being up by 11 cents, a small windfall for what lies ahead of what may now be viewed as a questionable ventured brand choice.